“It must be remembered that these are not just statistics, these are real people – men, women and children with lives, and hopes, and dreams” – Threshold. Around one third of national calls to Threshold last year were from tenants faced with losing their homes. That is according to Threshold’s annual report for 2017, which states that 73,526 calls were received in 2017, up from 71,319 the previous year. “Of particular concern to Threshold is the rise in the number of people contacting us in relation to tenancy terminations – over a third of our calls in 2017 relate to tenancy terminations, an 18% increase on the previous year. This points to the vulnerability of people in the private rented sector,” said Aideen Hayden, Threshold chair. This year is Threshold’s 40th anniversary and since its foundation the organisation has helped around half a million people with a housing difficulty. “Unfortunately, our services are needed now more than ever. Acquiring and maintaining safe, secure and affordable accommodation in the private rented sector is a huge challenge for many people in Ireland today, and not just in urban areas,” said Aideen Hayden. The report was launched on Wednesday 5 December 2018 by Minister for Housing, Planning and Local Government, Eoghan Murphy TD, who said that legislation is “imminent” and that it will introduce “stronger protections for tenants and more powers for the Residential Tenancies Board (RTB). 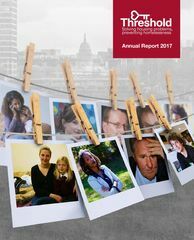 The Threshold Annual Report stated that of all the queries it received tenancy termination once again topped the list, followed by queries regarding rent review/increases (18%); seeking accommodation (12%); standards and repairs (7%); and deposit retention (7%). Threshold protected 4,376 tenancies last year. – a deposit protection scheme and a certification scheme, or an NCT for housing, which would make the private rented sector a viable, attractive and sustainable tenure option. Figures released last week showed that a total of 9,724 people experienced homelessness in October 2018. This is an increase of 26 people on the figure for September 2018, which was 9,698. It is a 15% rise from the total of 8,492 people homeless in October 2017. These latest figures from the Department of Housing, Planning and Local Government reveal that 3,725 of the total number of homeless people are children (in 1,709 families). This Tuesday, 4 December, the Rough Sleeper Count showed that the number of people sleeping rough in Dublin increased to 156. The count is carried out by 100 volunteers twice a year – this latest count in winter is up from 110 in the spring count. This was 15% down on the last (2017) winter count of 184, which was the highest ever. – city centre locations like Henry Street had fewer rough sleepers, but other areas like Rathmines saw more. – 67% of the rough sleepers were male, 17% female and the rest unidentified. – 54% were Irish, 17% from other countries and 29% unidentified. There are now 4,027 emergency beds for adults in Dublin – a 50% increase since January 2016.